Consumer profiling personalizes your customers messaging & experience. Consumer profiles, also known as customer profiles, provide a powerful way to get a detailed portrait of your customer base to help you make smarter, more effective marketing and operations decisions. Given the competitive nature of today’s restaurant and retail industries, consumer profiling has become a key component of the marketing process. If you’re not collecting consumer profiles already, you need to get started as soon as possible, because you are leaving money on the table. Bloom Intelligence gives you a way to collect these profiles quickly and easily, allowing you to personalize your customers experience. There are various ways to begin building your list of customer profiles. Statistics websites like the U.S. Census Bureau, surveys, questionnaires, third-party companies, and your company website are some examples. However, these solutions can be expensive, and they only give you a snapshot of your customers at that point in time. Additionally, these sources typically only give you general census data, or a very small sample size of your actual customer base. Bloom does it all for you. As a result, you can passively build hundreds and thousands of customer profiles passively. All you have to do is log into the Bloom platform and begin using your actionable data to optimize operations, personalize your marketing, and to measure your customers satisfaction. Demographics. Merriam-Webster defines demographics as the statistical characteristics of human populations (such as age or income) used specially to identify markets. Bloom gives you customer age, gender, birthday, and spending data. Location Data and Contact Information. You’ll have access to customer zip codes (useful for multi-chain businesses), names, phone numbers and email addresses. Behavior Data. This type of data includes things like customer visit counts, visit days and times, dwell times, first and last visit dates and times, locations visited, churn probability, and promotions received and redeemed. With this kind of data and the right tools, you’ll be able to configure and execute automated, triggered marketing campaigns that send your marketing messages to specific demographic groups when certain behavioral criteria are met. Likewise, the marketing campaigns you can create will be limitless and highly targeted to specific audience personas. This allows you to quickly increase customer value, customer frequency, customer spend, and your overall bottom line. Collecting consumer profile data can help you identify your ideal audiences and boost your marketing efforts tremendously by giving you detailed information about the purchasing and lifestyle habits of the audiences you’re trying to reach. What Can You Do with Consumer Profiles? Without a good understanding of who your customers are, you are forced to use mass-marketing strategy, sending out non-targeted messages to your entire customer base hoping the message engages at least some of them. Wouldn’t it be better to send more targeted messages to individual groups of customers giving you a better chance to engage them? For instance, you may send a completely different message to women over 40 years old who visit at lunchtime than a message you would send a male millennial who typically visits late at night. Also, it is important to remember that you’re not collecting customer profiles to simply research the data. You’re doing it so that you can identify customer personas and segment them into specific groups. After that, you will better understand, engage with, and market to your customers better and faster than your competition. Start by spending time researching your individual customer profiles. You should begin to see similar profiles that you can begin grouping together to form groups of typical customers. Then you can begin creating a list of these general customer segments, or personas. Once you have your list of personas, you can use them as starting points for brainstorming, executing and measuring ROI on your marketing campaigns. What Do Your Customer Want? What kind of action do I want this customer to take? What is the best way to reach this customer? Which kind of deals or promotions would interest this customer? Which kind of deals and promotions would this customer NOT be interested in? Are there new products or services that might engage this customer? What are this customer’s pain points? Why do they need what I offer? How can I attract and engage more customers like this? Have these customers given a positive or negative rating recently? What type of imagery would engage this customer? When you have your personas properly defined, and a plan for marketing to each persona, you can begin creating, sending and measuring your marketing messages. You can also use these personas to create customer acquisition campaigns in other channels by matching your current customer persona to the targeting criteria in your other marketing channels. These new potential consumers will have a higher likelihood of becoming a new customer, providing a much more cost-effective way of acquiring new customers. You are simply leaving money on the table by not doing something as simple as collecting and using consumer profiles, and you’re putting your business at-risk of becoming irrelevant to your customers as competitors invest in these tool sets to personalize your customers experience. Consumer profiles can vastly improve your marketing ROI and lower costs as you begin to collect these detailed customer insights. You’ll be able to make more intelligent, data-driven decisions as to what areas of your marketing strategy can be tested for improvement, and how to create innovative, more effective and engaging campaigns. Making marketing decisions on a simple opinion can have devastating effects on the success of your business. 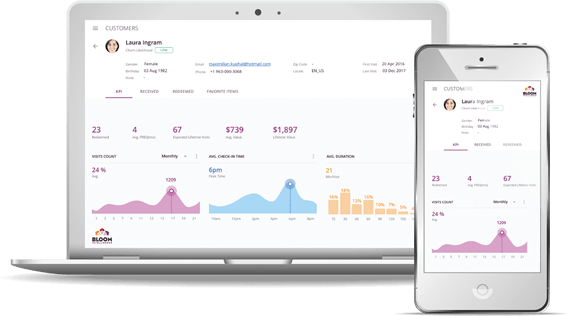 By using Bloom Intelligence to collect detailed customer profiles, you’ll finally have access to accurate, comprehensive data on your customer demographics and behavior patterns, allowing you to make data-driven decisions, drive company growth and build a much larger base of loyal customers. Interested in finding out more about how you can use customer profiling? Schedule a Demo now, or download the ebook below. Are You Ready to Grow Your Business with WiFi Marketing? Find out how Bloom Intelligence’s WiFi marketing software and solutions can help build customer loyalty and increase sales.